To be totally honest, I’m not sure I can give you an accurate definition of antipasto. I don’t have the slightest trace of Italian in my blood, which became painfully obvious at certain points in my past dating life. Thankfully fiancé Steve, while a little Italian, doesn’t subscribe to confining me to the kitchen for 11 hours every Sunday (um, who are we kidding, I do that to myself) in the name of the perfect sauce/gravy. He claims to make a mean marinara but so far I’ve seen no evidence of his skills. Honey, I know you’re reading, and just FYI, it’s tomato season. And I love you. 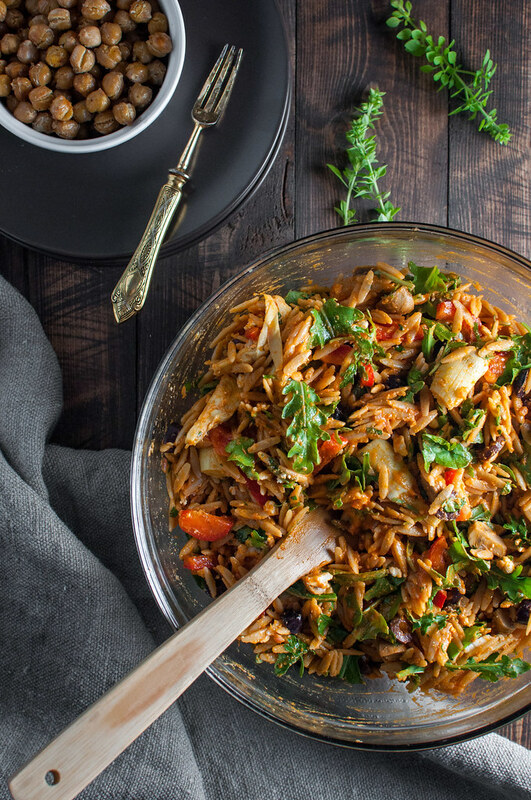 This antipasto orzo salad embodies my personal definition of antipasto: a big platter that comes out before the meal to spoil your Italian dinner. The platter can be filled with cheese, cured meat, bread, olives, oil, and roasted and/or marinated veggies. From my very limited reading on the matter, you might find seafood preparations included, but today we’re scratching meat (seafood included) for a bright but filling cold vegetarian summer pasta salad. At my belated birthday dinner with my future in-laws last night, Mom-to-be fondly brought up this salad, which debuted at their house on Mother’s Day. She noted how good the crumbled goat cheese was as it kind of broke down and combined with the dressing for a really creamy dish. Just a few days ago, I tested the salad again with feta, and I actually had no recollection of goat cheese, which was amazing, now that I remember it. 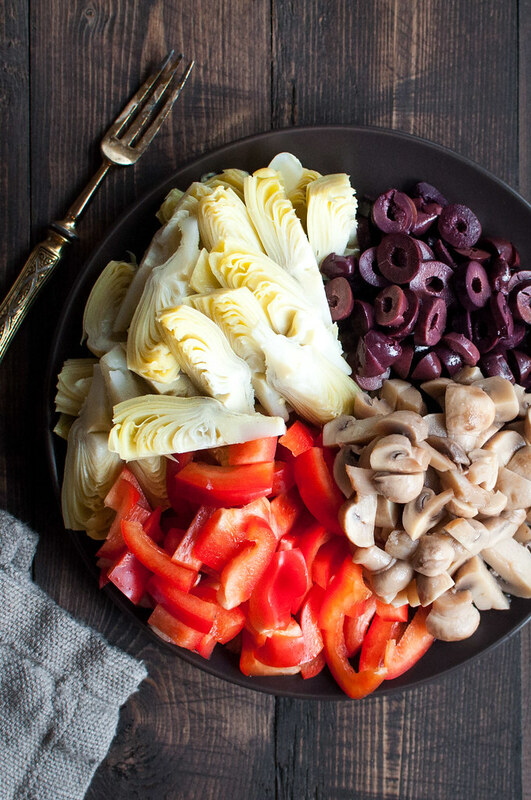 So, much like antipasto platters are flexible, I’d highly encourage using the base orzo and dressing recipe, then varying on the antipasto theme to your heart’s content. Want to throw in some cured meat or fish? By all means, go for it. Not all the ingredients in my orzo salad conform to antipasto tradition. For instance, instead of roasted red bell pepper, I left it raw to liven up the texture with some crunch. Toasted sunflower seeds or pine nuts, not pictured because I left them sitting on the counter two feet away during the photo shoot, also help out in the texture department while balancing the acidity of lots of lemon juice and tomatoes. 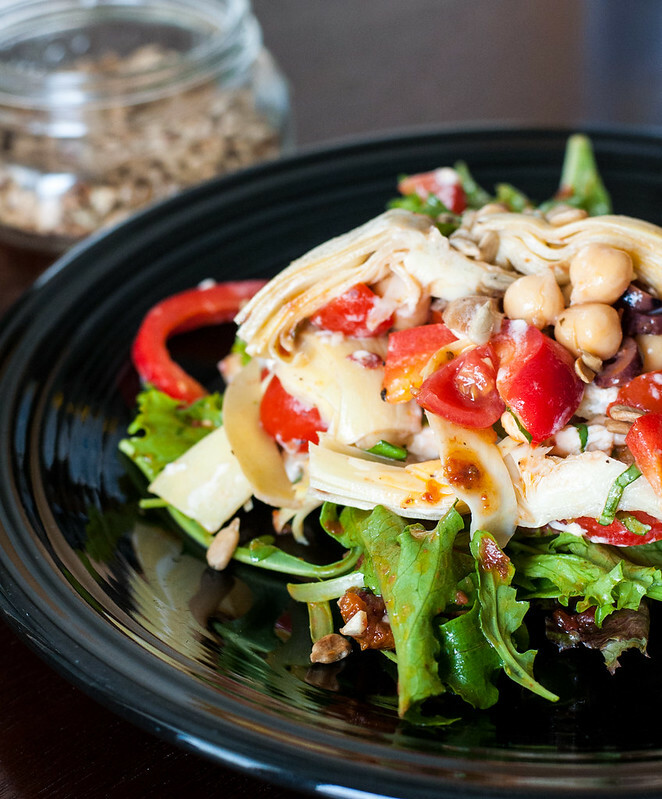 As if all that orzo pasta wasn’t enough, the easiest EVER oven-roasted garlic chickpeas add filling vegetarian protein, so there’s no question that this salad is a mean standalone entrée. Or the show-stealer at your next picnic potluck. Up to you. I’m going to skip talking endlessly about the dressing today–I did that in the blog post I gave it. I know sometimes it’s annoying to separate the dressing recipe on a different page, but it’s just one quick click away and it has more pictures! Which is never a bad thing right? More pictures = more Pinterest. I’ll let you decide if that’s a good thing. If you’re ever curious about the evolution of recipes, at least in my world (I can’t speak for other bloggers), here’s a mediocre pic of this salad the second time I made it, at my parents’ house in Minnesota in May sometime. Pretend the lettuce is orzo. Yes, that is THREE whole times I’ve made antipasto orzo salad so far before it hits the blog. What was I doing all that time? Mostly waiting for a good photo opp, but also fine tuning quantities and playing with the dressing recipe until I, by chance, nailed the fresh tomato version included here. And that is how it goes down in the Natural Comfort Kitchen. Only the best for my readers. 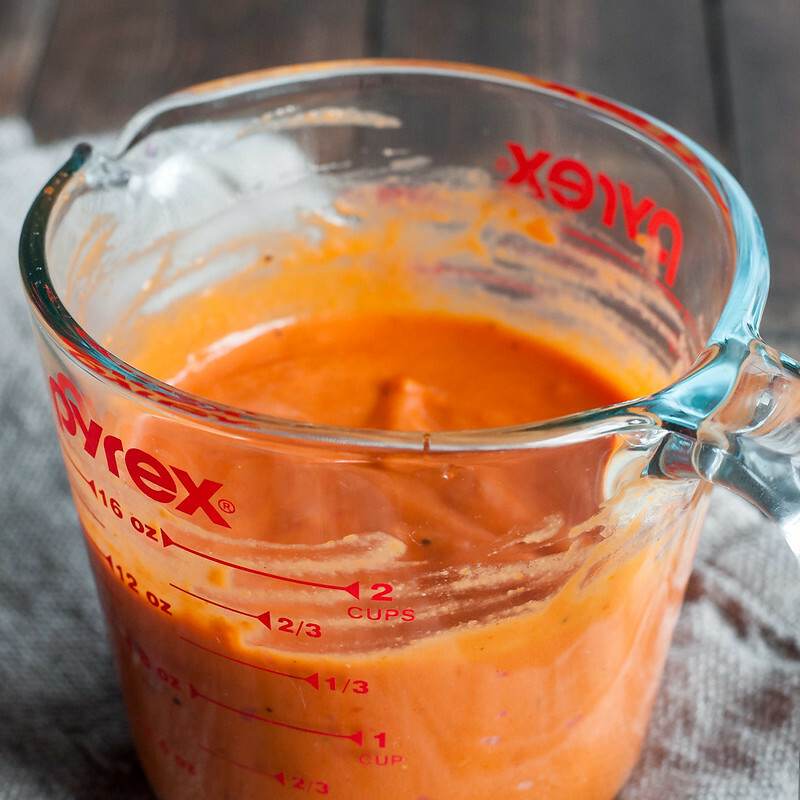 Creamy fresh tomato dressing--without any dairy or eggs--puts a fresh twist on the ubiquitous summer pasta salad. 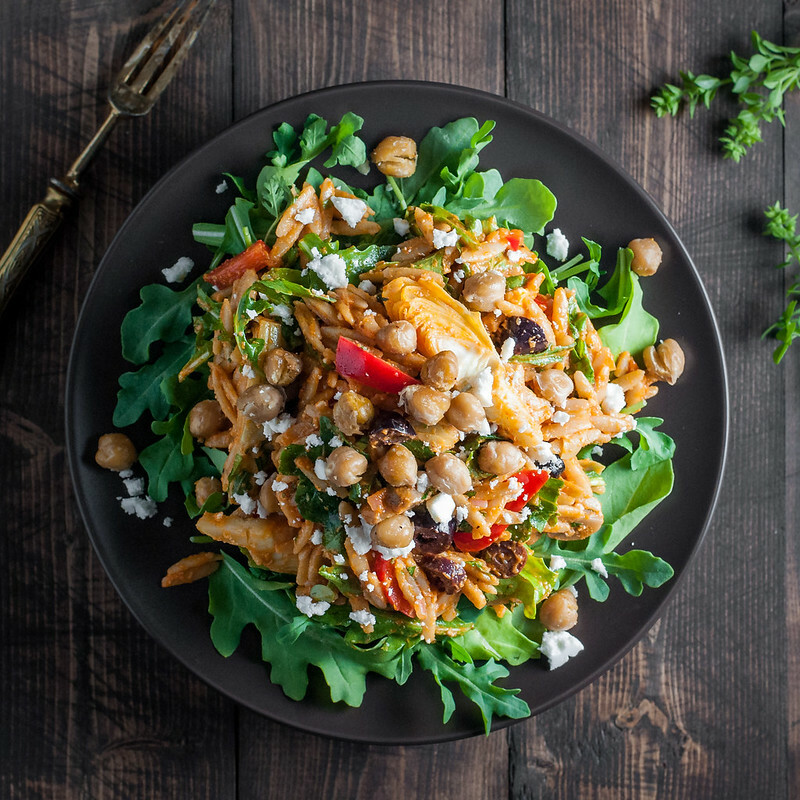 Antipasto favorites, peppery torn arugula, and addictive garlicky roasted chickpeas add texture, taste, and nutrition to a base of dressed orzo pasta. Preheat oven to 425 degrees and move rack near bottom. Bring about 3 quarts water to a boil while you prepare the chickpeas. Dry chickpeas by placing between 2 layers of a clean dish towel and rubbing gently. On a rimmed sheet pan, toss them with 1 tablespoon oil and garlic salt to coat well. Bake until golden in places and slightly dry on the outside, but not crunchy throughout, about 13 to 15 minutes. Shake the pan once or twice during baking. Set chickpeas aside to cool. When water boils, salt generously and cook orzo al dente according to package instructions. Test during the last couple minutes to avoid overcooking, and don't rinse after draining. 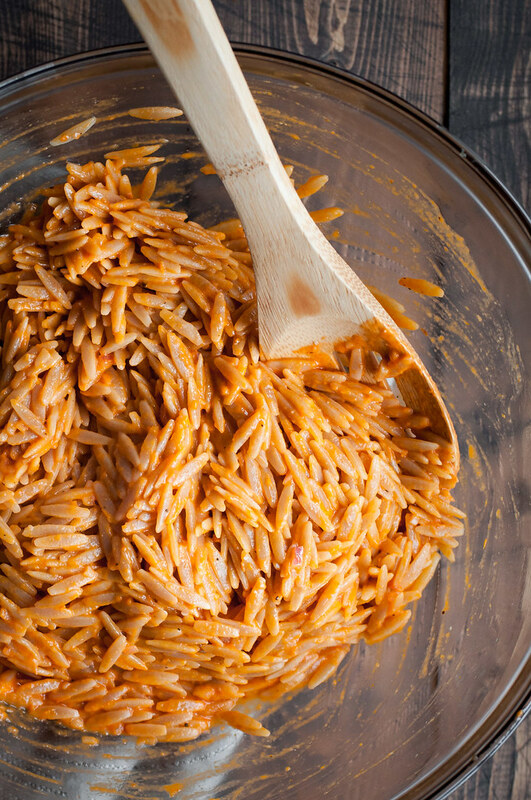 In a large bowl, combine warm pasta with about a third of the dressing. Set in the fridge to cool while preparing the rest of the ingredients. Stir artichokes, bell pepper, olives, mushrooms, and the remaining dressing into the orzo. Fold in the fresh herbs, feta, and torn arugula. 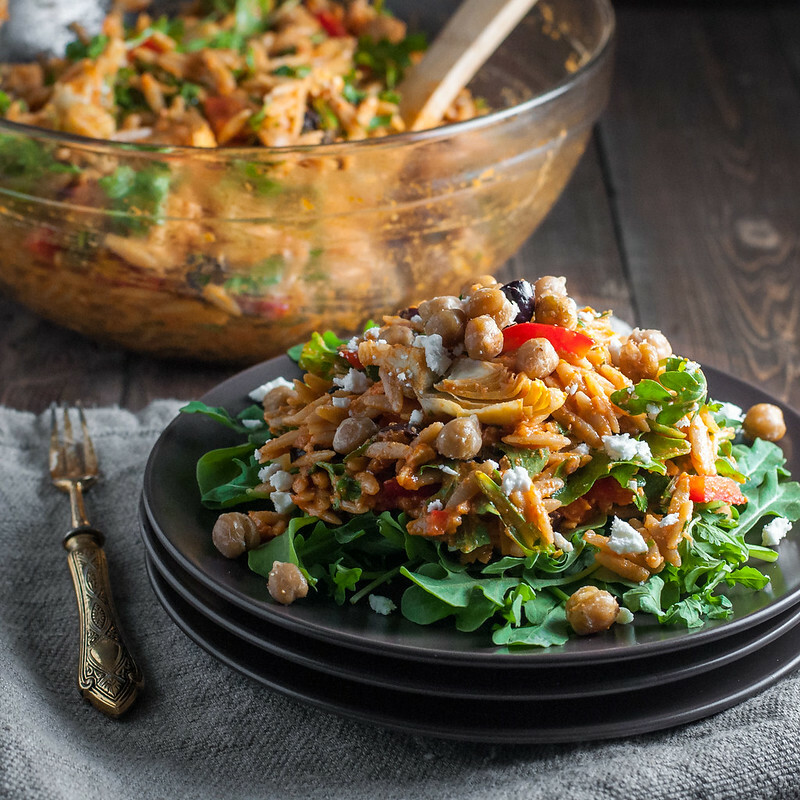 The chickpeas can be stirred into the salad or served on top. Check for final seasoning, but it's unlikely you'll need it, given the many salty ingredients and peppery arugula. If desired, serve orzo salad over a bed of arugula (best to skip this if you're bringing it to a potluck or picnic) and top with toasted seeds or nuts. As written, the recipe is vegetarian and gluten free. It could easy be made vegan by checking your ingredients and omitting cheese. Note: This page contains affiliate links. It does NOT contain sponsored content. Affiliate links (to products I recommend, on Amazon) offset my ingredient and website maintenance costs, so I can keep bringing you Italian-ish recipes like this one. Thanks!